TechnoServe's Dickson Mbando offers insight into win-win scenarios that benefit both farmers and the private sector. Sam Koole on his mango farm in Uganda. Year after year, Sam Koole and other farmers in Uganda watched their mangoes go to waste. “There was never a market for them, so we would just let them fall down on their own. The children would eat a few, and the rest were left to rot,” he said. For Sam and the others, it was a wasted opportunity to earn much-needed income. At the same time, in East Africa, The Coca-Cola Company faced a challenge of its own. The region’s growing middle class was driving increased demand for fruit juices, but Coca-Cola did not have a way to source fruit locally. Importing fruit puree from other continents meant higher costs for the company and higher prices for local consumers. 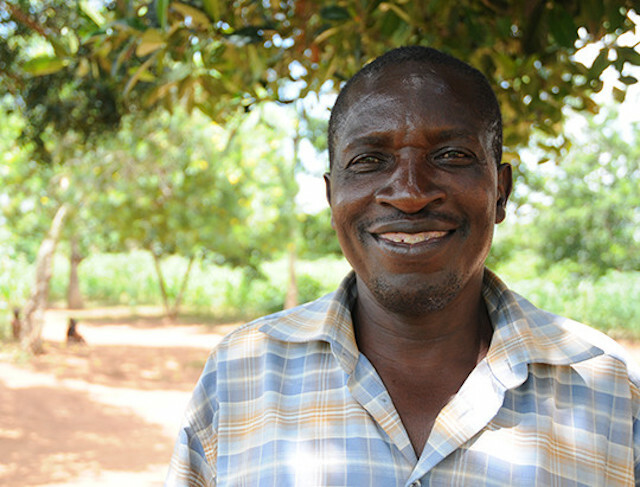 East African farmers, like Sam Koole, had ideal growing conditions to produce the fruit that Coca-Cola – and other local markets – would need. But many farmers didn’t have the right seeds, specialized agronomic information, or the credit needed for investments. And there weren’t many local processors that could meet the high standards needed for turning local fruit into puree for Coca-Cola’s juice products. Somewhere here was a “win-win” scenario that would mean stable markets and increased incomes for thousands of smallholder farmers who struggled to escape poverty. But any success would depend on overcoming those steep obstacles. 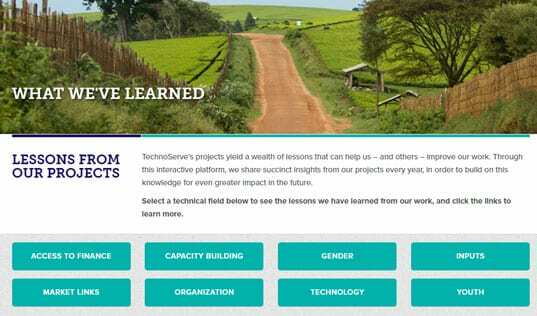 In 2010, TechnoServe, which specializes in business solutions to poverty, partnered with the Gates Foundation and Coca-Cola to launch Project Nurture. The goal was ambitious: double the average income of 50,000 small-scale mango and passion fruit farmers in Uganda and Kenya, and help them connect, if possible, into Coca-Cola’s supply chain. Project Nurture started by providing farmers with targeted training, demonstrating approaches that fit the specific conditions of their farms. The next step was to create and strengthen producer business groups (PBGs), cooperative businesses that manage bulk sales of the fruit. As a result of these efforts, thousands of farmers began adopting new agricultural techniques, and improved their yields by an average of 21 percent. But the problem remained – where could farmers find a stable and profitable market for their crops? With help from Project Nurture, the PBGs began creating direct commercial ties with 16 fruit processors and more than 150 wholesalers and regional exporters, ensuring higher prices for farmers and a faster route for fruit from the farmer’s field to store shelves, reducing waste and spoilage. Staff from Coca-Cola and TechnoServe also worked with fruit processors to improve their quality control and production processes. As a result, several of the processors in Kenya were able to supply Coca-Cola with fruit puree used to make Minute Maid Mango, some of which was used to supply a further six African countries. This has not only driven demand for locally-grown fruit, but has presented long-term business benefits for Coca-Cola, (such as reduced costs, lead times, and supply chain risk), providing an incentive for all parties to maintain and deepen their relationship. As a result of these market linkages, including to local fresh markets, PBGs increased their sales volumes by an average of 200 percent, with individual farmers doubling their sales volumes, on average. 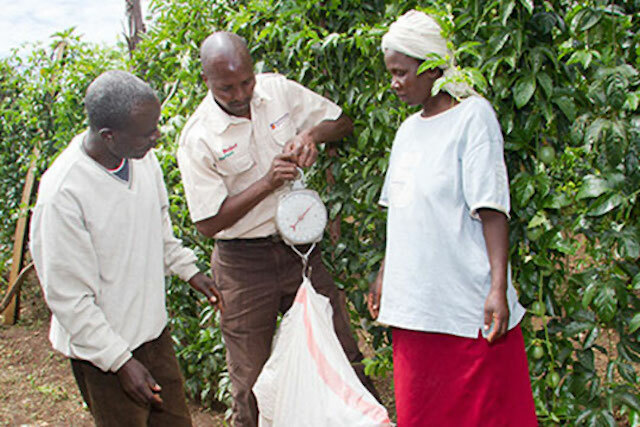 Mango farmers in Kenya weigh their fruit harvest. All told, the farmers involved in the program have increased their net revenue by 142 percent, with the PBGs selling 132,000 MT of fruit. What is most exciting about these results are that they are likely to be sustained in the future. 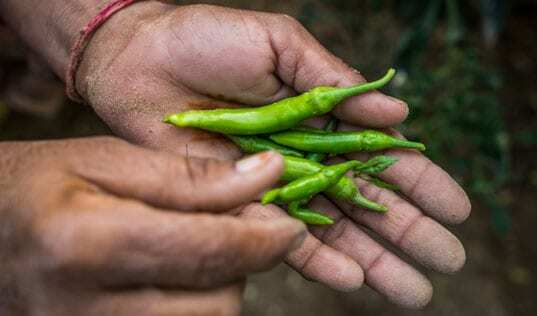 The inclusion of a partner like Coca-Cola means that there will continue to be a stable puree market for much of this fruit, and because sourcing locally has benefited Coca-Cola financially, the company is likely to invest more in the local value chain. Around the world, 2.5 billion people like Sam rely on farms of just a few hectares for their main source of income and sustenance, and many struggle to escape poverty. At the same time, many businesses find it challenging to source locally and create sustainable supply chains in developing countries. Creating these “win-win” scenarios for both poor farmers and the private sector is not easy – but it is necessary. If we are serious about tackling poverty in a way that lasts long-term – the “Sustainable” part of the new Sustainable Development Goals – then efforts like Project Nurture can light the way forward.